Dimensions: 47" x 14" x 3.5"
Multi-purpose dorm items are some of the best dorm essentials. Your college dorm room is going to be pretty small, especially when you factor in that you'll be sharing that room with your college roommate. These multi-purpose dorm items allow you to get a lot of use from one dorm necessity, which allows you plenty more space for other dorm essentials. Our Gray Full-Length Hanging Mirror with Jewelry Cabinet is one of those multi-purpose dorm necessities that allows you plenty of dorm room storage, some extra dorm room decor, and is even a dorm space saver! 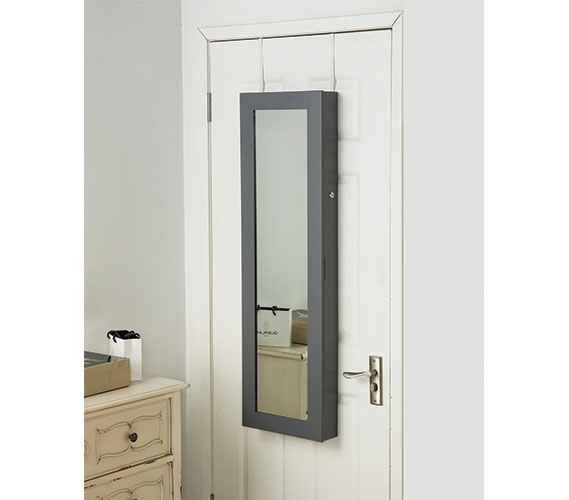 Our Gray Full-Length Hanging Mirror with Jewelry Cabinet hangs right over your main dorm room door or college closet door for compact dorm room storage that takes advantage of a dorm storage solution that is often forgotten. As this dorm essentials item uses a pre-existing dorm item, you'll have plenty more floor space and even more space on top of your dorm dresser for other dorm necessities. 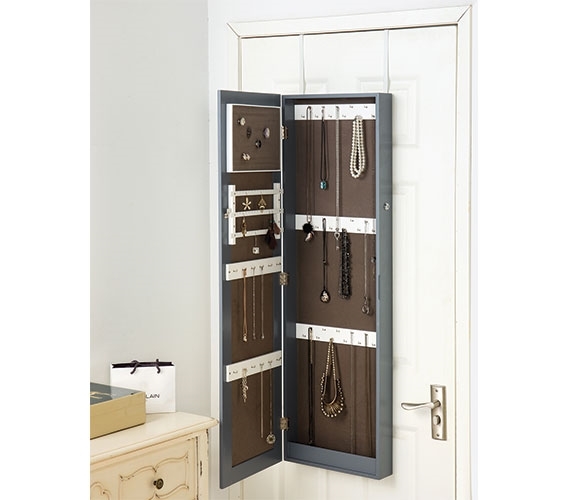 A gray border surrounds a full-length mirror and plenty of dorm organizers for your jewelry in our Gray Full-Length Hanging Mirror with Jewelry Cabinet. Your college dorm room won't come with a full-length mirror that allows you to see your outfit and get ready right in your college dorm room. This dorm storage solution changes that and allows you to get ready in your college dorm room, check out your outfit, and even use your mirror to match up your accessories with your outfit. Behind this mirrored door you'll find hooks for necklaces, bracelets, and earrings and slots for rings and earrings so you can keep every piece of jewelry neatly organized under a lockable door. 47" x 14" x 3.5"